This may come as a shock to you, but your wood fired pizza oven is going to be hot after cooking in it! This is why you always need to wait before cleaning the oven; you don’t want to burn yourself. Leave it overnight, or clean it on a day when you haven’t been cooking with it before so you can avoid any silly injuries that could have easily been avoided – no matter how dirty it is, it can wait. Build up of debris in your pizza oven can not only make your food taste a little strange, but it also has the potential to catch fire, which can be very dangerous. If your wood fired pizza oven is particularly dirty, and you want to use it, it’s best to use your regular oven instead this time and clean your pizza oven before you use it next. A brush alone may not be able to clean up your pizza oven, you might need to dig in there and actually clean up with a scraper. Put a bit of arm muscle in and get to work! Cleaning may take longer than you anticipated, but a nice, clean pizza oven will definitely be worth it in the long run for that little extra effort. The best way to clean the soot off the walls of your pizza oven is to start a fire in it. Once the fire gets really hot, it will just burn away the soot on the walls, meaning that you don’t actually have to get in there and do it yourself. The right temperature for the fire should be approximately 370 degrees Celsius for this trick to work. 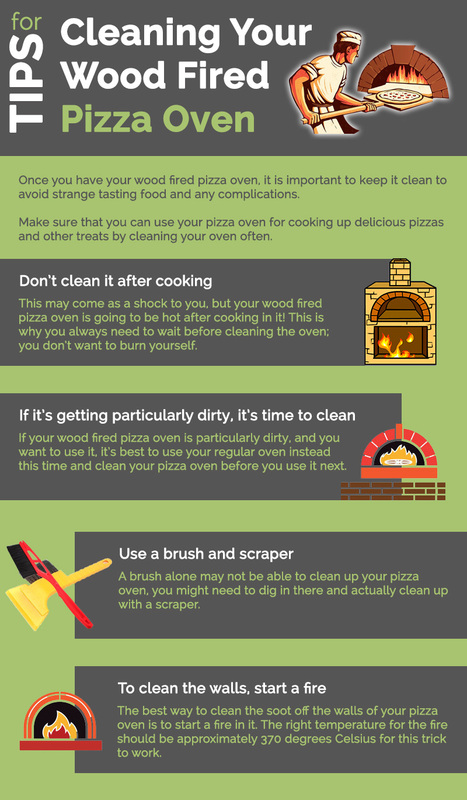 Want more cleaning tips for your wood fired pizza oven? At Sydney Heaters and Pizza Ovens, we are the experts in knowing what’s best for your oven. Not only do we have a great variety of ovens to choose from, but we are also happy to provide advice on cleaning, cooking, installation, and more. If you have any questions about purchasing a pizza oven or about your existing pizza oven, then make sure to give us a call for some friendly, helpful words of advice.